Think of them as podcasts from decades ago: Horror masters like Stephen King have pointed to the rich imagination of radio shows as offering more appropriate terror than the page or screen. In the era before television (just imagine), purely audio suspense was provided by not only by the writers, actors, and the listeners’ own imaginations, but the sound-effects engineers, in an art form that has now been lost to the ages. Gruesome shows like Inner Sanctum and Lights Out! helpfully provided health precautions with their intros for faint-hearted listeners. But the era’s premiere radio drama, Suspense, also offered lots of scary moments for the thrill-bound, as did the more adventure-based Escape and the sci-fi-themed X Minus One. Then the sound-effects guys would go to town, cracking walnuts to indicate bones and using ripe melons to depict bodies falling from buildings: the squishier the better. For Halloween this year, try one of our selections below, with mournful organ chords, creaky doors, and various screams by some names you’ll recognize, as many film stars flocked to the popular radio medium in an attempt to get further exposure. That’s only if you dare, of course. The classic radio anthology series Suspense was known for its twisty dramas, but this one goes beyond twisty. Impacted by the post-war housing crisis, a young couple finally finds a house near the husband’s new job. They start to hear unearthly howling sounds… from the hall closet. Then the wife disappears, and a mailman (the show’s only comic touch) is mauled. Robert Taylor (Barbara Stanwyck’s ex) adeptly narrates the chilling tale from a manuscript left at the house. The circuitous ending has been debated by radio fans for decades, which still doesn’t make it any less unsettling. Boris Karloff was not only a legendary horror-movie actor, he had a wonderful voice for radio (check out his vocal work in the animated special How The Grinch Stole Christmas for a classic example). Lights Out! auteur Arch Oboler (known as radio’s Orson Welles) loved to use Karloff, who was up for pretty much anything. In this episode, he’s a hen-pecked husband sick of his selfish, unfaithful, vain wife, and eventually lashes out at her and calls her a cat. Then she gets even more feline in her actions, and the family bird mysteriously disappears. This is another fun one for the high-bar challenges routinely posed to radio actors and sound-effects staff: What would a human/cat hybrid sound like? Another great horror actor, Vincent Price made his ultimate radio mark with what some call the most frightening radio show of all time. Here he’s a lighthouse keeper who sees an abandoned ship wash up on shore. Unfortunately, it’s filled with hungry rats who are looking to feed after being stuck out at sea. Only Price could describe the rats swarming the beach “like a moving brown carpet” in such a chilling manner. The lighthouse keeper and his two coworkers are trapped in the tower as the rats swarm up the stairs, resulting in a show that will inspire nightmares for the rodent-phobic. Here’s an example of the effectiveness of the found-footage tactic decades before The Blair Witch Project. Ralph Edwards stars as a cheeky radio DJ stays in a supposedly haunted house overnight, recording it for his listeners. The show starts with the DJ’s ruined body, so we know things aren’t going to end well, as we then listen to his recording from the night before. But the way Edwards segues from his smooth disc-jockey patter into outright terror, as bats and creaky footsteps hint at the actual horrors in the house, make this one, like Blair Witch, almost too scary to get all the way through. The rare radio horror show unfortunately based on a true story, this is a radio version of Devil In The White City, a thinly fictionalized version of Henry Holmes’ nightmare castle on Chicago’s South Side during the 1893 World’s Fair. Fans of that book (and upcoming movie) should check this out, as at least the evil proprietor receives some comeuppance in the end, from a young girl looking for her lost sister who went into his massive house and was never seen again. Peter Lorre had another one of those amazing voices for radio, one that could never be mistaken for anyone else. His creepily unusual quality made him a favorite over at Inner Sanctum, home of the creaky door; he’s a downright sympathetic character in that show’s “Black Seagull,” playing a grieving widower. It’s practically a one-man show for Lorre, as he only occasionally talks to the local doctor and the spirit of his dead wife. But is he actually being haunted by his recently deceased bride, or is he so grief-stricken that he’s lost touch with reality? Is his wife trying to drag him into death, or is he heading there all by himself? Not many actors could pull this kind of range off in a half-hour, making “Black Seagull” one of Lorre’s best. 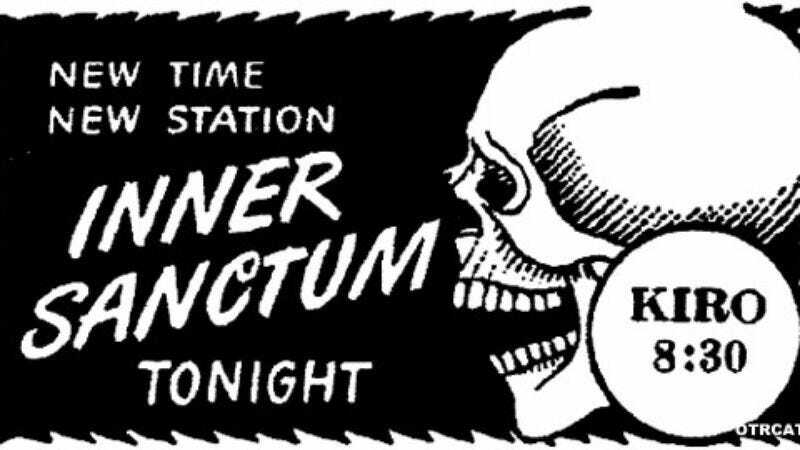 Several radio stations kept playing this show every Halloween, even after the golden age of radio, because it’s likely the most insane thing Arch Oboler ever produced. A mysterious mist floats in and turns whoever encounters it inside out. You can only imagine the fun the sound-effects team must have had with this; apparently, a rubber glove was used to approximate the sound of revolving skin. But what’s even worse is the sound the poor inside-out people make as they lie there helpless with their organs on the outside. Everyone’s worst-case scenario, in the pre-cell phone era: This show sounds like the premise to a classic campfire horror story. A couple is in their car on a back road on a dark and rainy night. They hear on the car radio that an insane murderer has escaped from a nearby asylum. Then their car dies, and a frantic woman appears in a lightning flash. She begs to be let into the car, as she’s hiding from the murderer, too—or is she the murderer, and using this as a ruse? The performances here make it hard to tell either way, led by Cary Grant, obviously enjoying himself in a part totally unlike his screen persona. The claustrophobia of the situation sets in slowly, as the couple realizes they have no option but to sit in the car and wait it out, and the panic begins to build. This episode featured two of radio’s greats: Orson Welles, who made his mark in radio before conquering the movies, terrifying the nation with his 1938 War Of The Worlds broadcast on his own Mercury Theatre program. Welles understood the radio medium and also had a remarkable voice for it, often playing numerous parts behind the same microphone. Here he’s paired with another radio legend: writer Lucille Fletcher, author of the Suspense classic and Agnes Moorehead tour de force “Sorry, Wrong Number,” and then-wife to Welles’ frequent composer, Bernard Herrmann. In the frequently rebroadcast “The Hitchhiker,” Welles is a young man who takes off on a cross-country trip who keeps spotting the same mysterious hitchhiker on the road, even though there’s no way the man could be keeping up with him. The fear, of course, is that this strange, foreboding figure could only be signifying the worst. Many Ray Bradbury short stories were an excellent fit for radio, but maybe none as effective as X Minus One’s effort here. Explorers on an escape mission to Mars are ecstatic to find the planet populated with their long-lost relatives and idealized hometowns. Too late, they realize that the Martians have tapped into their psyches to lure them with the things they desire most. But audio is a perfect gateway for the pathetic glee from the explorers as they spy their grandparents, and their anguish as they realize the horrifying reality. Screen legend Joan Crawford only made a few appearances on radio, where she was apparently so nervous to speak in front of a live microphone, she asked if she could remove her shoes and perform barefoot to make herself more comfortable. Still, she sells her part here in her most sympathetic Suspense performance, as a woman whose younger sister’s obsession with her results in the direst of consequences, with a tragic ending that’s hard to shake. Many Lights Out! episodes featured headstrong, wayward girls making the wrong decision, as in “Murder Castle” above or “It Happened,” where a girl gets permanently lost in the Paris sewers. Here two of them unfortunately run into a terrifying faceless menace, who holds them prisoner as he offers them impossible options based on the flip of a coin. One will be murdered, one has to be his bride forever. Sometimes the fun of Suspense was to hear usually sympathetic stars shift roles a bit. One actor who appeared to enjoy these acting challenges was Robert Young, the lead on Father Knows Best. In various Suspense appearances he played a pyromaniac, a serial murderer, and here a man trapped in an asylum with no memory of how he got there. In another plot that offered everyone’s worst-case scenario, Young expertly skirts the line between sanity and dementia: Is the nurse actually his wife or just someone who looks like her? He plumbs the depths of emotional misery and menace until we’re no longer sure if we should be rooting for our hero or not. The fact that this possible maniac is portrayed by one of pop culture’s favorite patriarchs just makes it more chilling.